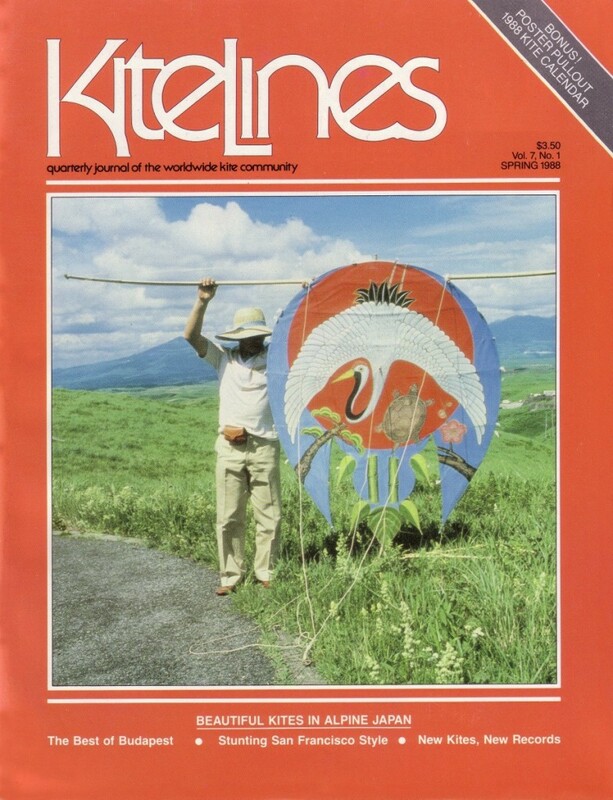 Cover Story: Beautiful kiting in alpine Japan, with Valerie Govig at the ’87 World Kite Festival at Mt. Aso on Kyushu, photos by Ted Manekin, cover photo by Simon Freidin. Features: Valerie Govig on the Ontario Science Centre Kite Festival, Canada; One Sky, One World, Year 2; Rino Milone at the Budapest Spring Kite Festival, Hungary. Departments: Letter From the Publisher: the magazine’s move to new quarters; What’s New: Kites: Stan Swanson’s California Condor and Swallow-Tailed Kite, Reza Ragheb’s Buzzing Bee, the Boreal Delta and Jerry Sinotte’s Big Magic Delta; What’s New: Books: Drachen bauen and steigen lassen (Making and Flying Kites) by Schimmelpfennig, Dynamite Kites by Wiley and Cheatle, Kitefolds by Matthews, Kleine Papieren Vliegers (Small Paper Kites) by Van Veen, Making and Flying Modern Kites by Rowlands, Kites for Kiwis by McGeorge and Seven Kites by Gomberg; Design Workshop: Margaret Greger on Bill Goble’s Starbox; Tips & Techniques: Tamoshi Takahara on keel variations, John Reutershan on box kite joining and alteration; Quickites: Dennis Kucmerowski on the Comics Kite, a sparless delta; Stunt Diary: the 1st annual West Coast Stunt Kite Championships in San Francisco, CA; In the Wind: Bob Price on eye-opening kite accident statistics, other news; For the Record: a new longest kite in France, a parafoil on K2 and other high location flights; Club Watch: new clubs needing new members; Empty Spaces in the Sky: John H. Sherburne, Thomas E. Cowls, David B. DeBolt, H.A. Spafford, Raymond D. Reel and John W. Jordan; Best Of Show: parafoil and photo by Doug Hagaman. On Daikanbo, Japan, a magnificent Baramon kite is ready for flight with traditional crane motif and powerful hummer. Photograph by Simon Freidin.